Earlier in June, I took the 21 bus along with four others to University in St Paul and then caught the 16 headed east. We arrived at Sibley Bike Depot, tucked in a strip mall past the “Sugar Rush” donut shop. Chocolate and sugar wafts down the hall into the bike shop. Inside the walls are lined with drawers of varying heights and sizes with bike parts and tools hanging above. The shop floor has several bike stands to work on and tools. There are also bikes for sale on display- Schwinns and Huffys and Raleighs and more. 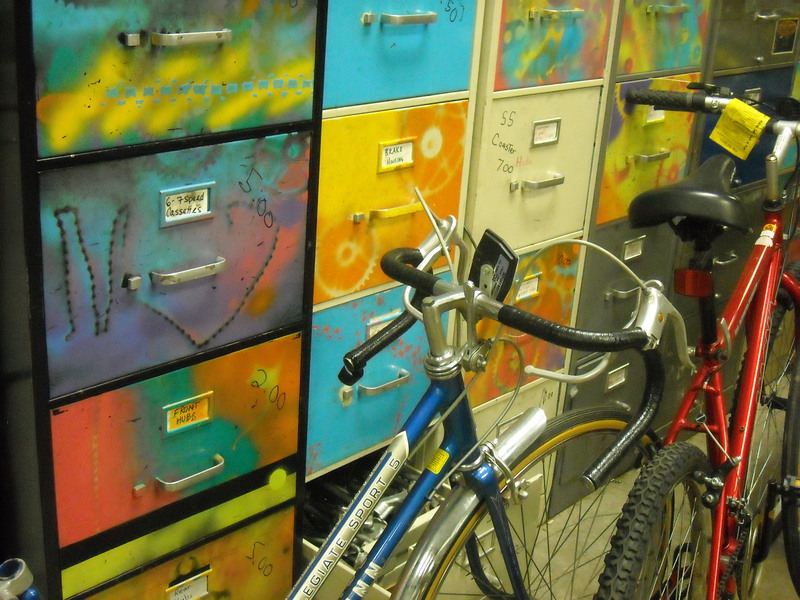 We got a peek into the bike storage room which is usually locked up. A pile of bikes at least a dozen feet high and 30 feet long dominates the room. The bikes are layered one on top of the other; handle bars jammed into back wheels and seats knocking into pedals. All of them are donations. 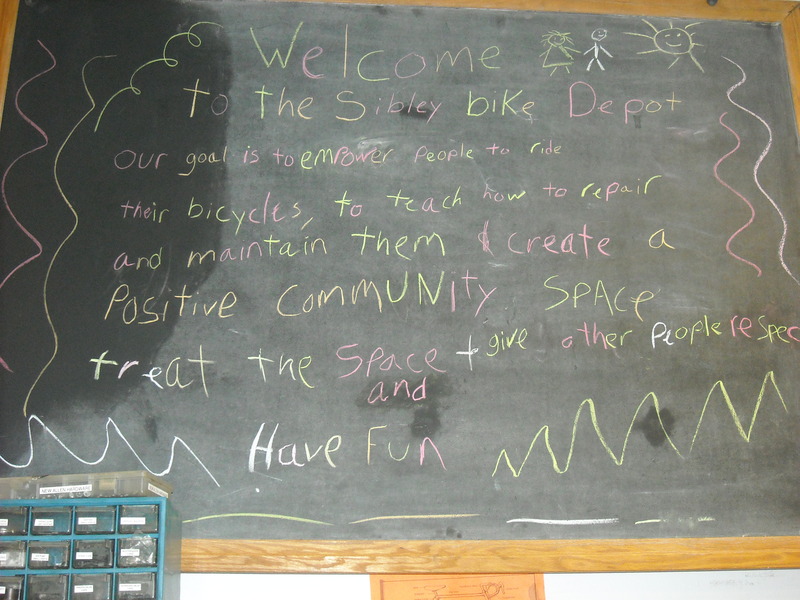 Sibley Bike Depot is a non-profit community bike shop that Summer of Solutions is partnering with. 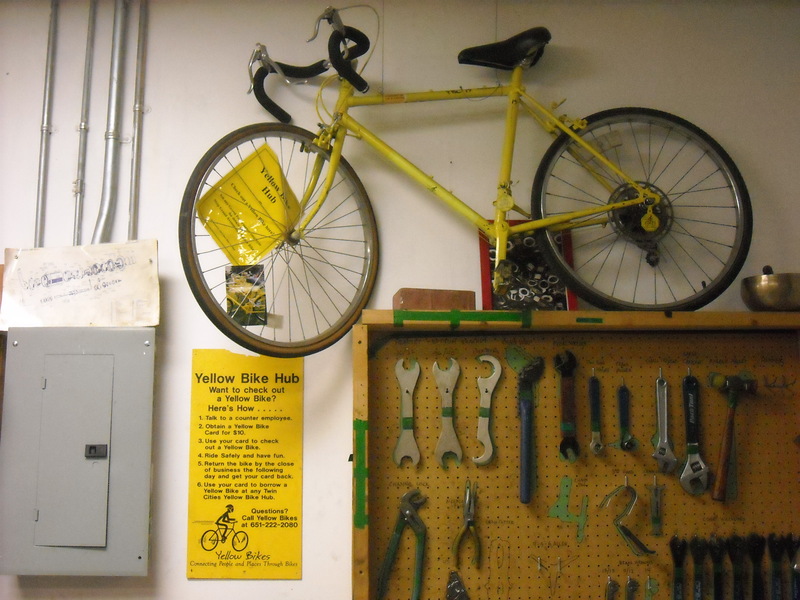 It has gone through several incarnations as an organization, one of them being the Yellow Bike Collective, which inspired the Yellow Bikes of Hampshire College (where I go and occasionally have a go on a Yellow Bike). Recognizing how many opportunities bikes open up, Sibley’s current mission is to increase bike access in the Twin Cities. 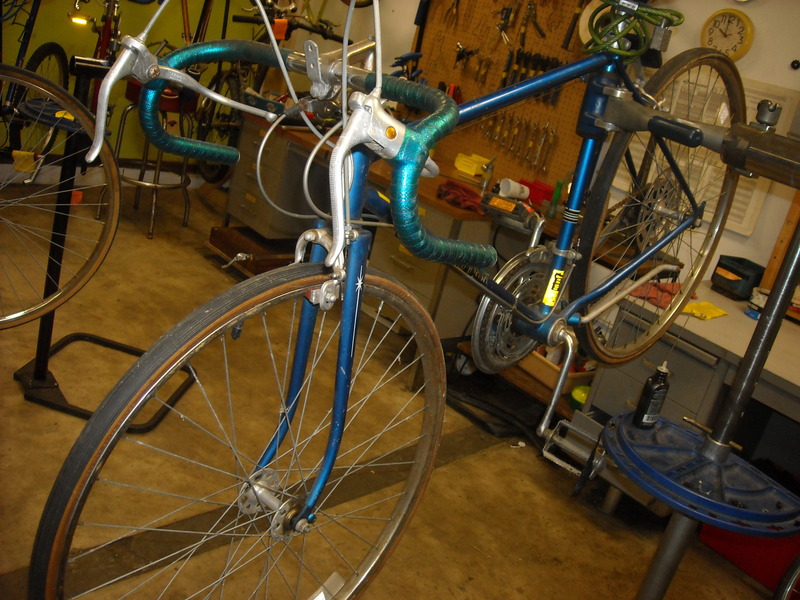 People donate bikes to Sibley, then volunteers and staff fix them up for sale. People who come into the shop and work on a bike can earn it to keep. This past Friday, we got to fix up our own bikes and take them out on the town. 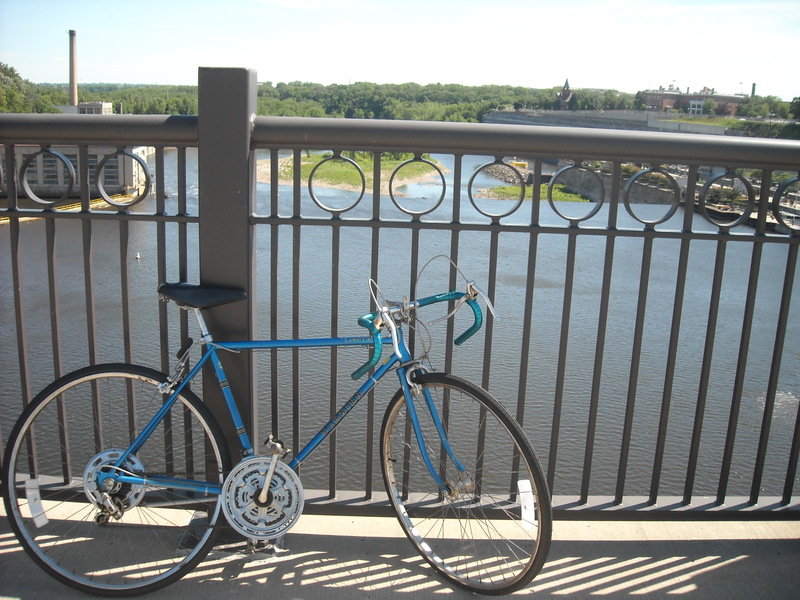 I worked on a blue Schwinn Caliente that I’m dating to around 1980 (the only sticker on it says “Minnesota 1981-82. Wear a helmet.”) The tires needed replacing as well as both tubes. I thought I was just about ready to go but the gear shifters turned out to be rusted. (A tiny spot at the bottom end of the shifter had let in all the moisture which caused a substantial amount of rusting. “That’s Minnesota winters for you,” was all the mechanics had to say about it.) But finally around 1 pm my Schwinn was ready to go. This summer a few of us will be helping Sibley on a community listening project to build partnerships in the University corridor neighborhood. Some people will also be researching other bike shops and non-profits to learn about their decision making processes and structures to help Sibley during a time of rapid growth. I personally am interested in how women and transsexuals can benefit from the programming Sibley offers, as bike shops can easily become exclusive, macho environments. Currently, Tuesday nights are for women and trans but the organization lacks capacity to significantly increase these opportunities. Encouraging more women to become mechanics is an important first step in this process, as currently there is only one female mechanic on the staff. I’m looking forward to improving my skills working on bikes and helping other people learn as well. Bikes can be a lot more than a fun accessory and Sibley recognizes the huge role bikes can play to empower people. And after all, the Twin Cities were just named the Most Bike-able in the country, so why not open that advantage up to everyone? After. Bridge across Mississippi by the Ford Plant.